Bake a sheet cake the size that you need. Cut 1 1/2 inches from the length of the cake. Add this to the end to make it a longer rectangle. 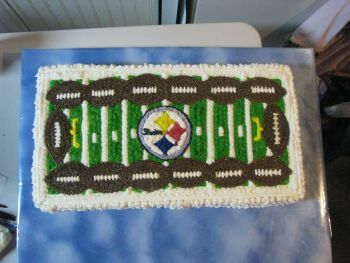 With icing filled bag and tip #5 draw the football field design on the cake top. At this time put the logo of your favorite team in the center of the field. You will use tip#5 to do all the outline work and tip #16 to do all the fill in work. First outline the footballs in brown icing, then fill them in with the same color icing. Make a line in the center of each football with white icing. Now make small stitch lines across that line. Next outline the yard lines and the small ones between the yard lines with the same white icing. Fill them in with the same color. Still using the white ,outline the entire field. Outline the goalposts in yellow icing. Do the outline work on your chosen logo in the appropriate colors, then fill them in. Make a green icing and fill in all the green areas of the field. Finally fill in the sides of the cake with white icing.